Capcom recently revealed that they’re working on Mega Man 11, which is due out late next year. I have a lot of different opinions about that game, but that actually wasn’t the thing that I was most excited about. Capcom is also finally going to be bringing the two Mega Man Anniversary Collections to Switch, as well as every Mega Man X series game. That’s nineteen Mega Man games on Switch next year. I’m going to be so happy. All that said, I think what pleases me most is that I’ll be able to get all of the X games together in one spot. Oh sure, I have the X collection on GameCube, but a) that’s not portable and b) it’s missing X7 and X8. Probably something about bad porting quality too? I don’t know. The point is, today I want to talk exclusively about the Mega Man X series and what makes each game special. Before I start, I’d also like to point out that I haven’t played most of these games in a decade or more, so I’m coasting on memories here. Some facts may be mixed up or flat-out wrong. Enjoy! I’m not ranking these games, just talking about some facets of each one that stood out to me. But if I were ranking them, Mega Man X would absolutely come out on top. There’s no denying that it’s the best game of the series. X2 comes close, but even that one is missing a certain special something that MMX just gets so perfectly right. 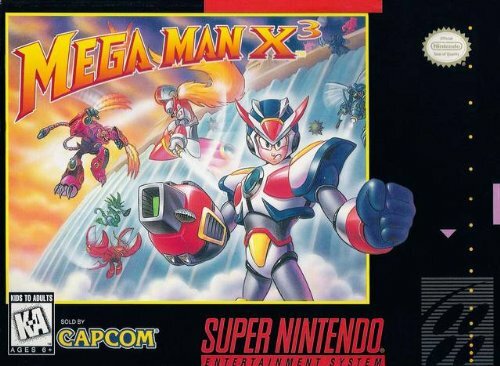 Here’s the thing though, Mega Man X is easily one of my favourite video games of all time. I play it at least once every year, and I buy it again on every machine that it can be played on. 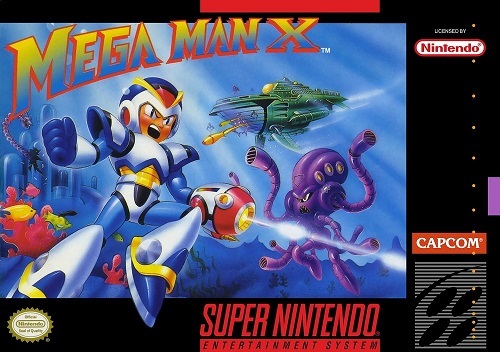 Mega Man X is like a security blanket. It something intimately familiar, something that comforts me even just by thinking about it. I know it inside and out, and I can beat nearly the entire game using just the X-buster (except against the final boss, he’s just too tough for that). Mega Man X is great because it’s a refined version of the Mega Man formula with an emphasis on speed and action. You’re working with a very strong base of jumping and shooting, and when you add awesome things like wall jumps and collectible armor parts, that just helps to expand the experience. It also has what I consider to be some of the nicest 16-bit sprite work out there, and the soundtrack is phenomenal. If I had to say one negative thing about Mega Man X? Launch Octopus is too hard, I guess? As I said above, X2 comes very close to being just as good as it’s older brother. Like most Mega Man games, it’s basically the exact same thing, but with new stages, bosses, and weapons. But Capcom also saw fit to sprinkle in a few other little things here and there that added and subtracted from the experience as a whole. The most notable “feature” in this game is the addition of the X Hunters. Three difficult mini-bosses that appear after you complete two stages. They warp around randomly, are hidden within whatever stage they land in, and will disappear if you don’t beat them all quickly enough. Yes, they are optional bosses, but you need to beat them to get the good ending, and more importantly, bring Zero back to life. And Zero is super cool, so you will always feel bad if you opt to leave him dead. Since you have to fight all three of these guys again in the endgame regardless, it’s really nothing more than a huge pain to have to track them down and beat their mini-boss versions. Mega Man X2 also introduced the speeder bikes (“Ride Chasers”) to the series, which is a sin that I will never forgive. Some of the more positive additions include things like bosses that are bigger than the screen, use of magical chips for sweet 3D wireframe effects, Green Biker Dude, and air-dashing. Friggin’ air-dashing, man! Mega Man X2 was the first game I ever played that had an air-dash move, and ever since then, platformers without one feel like they’re missing a core component. It’s just such a cool move, and so helpful for getting around. Paired up with X’s wall-climbing ability, you were given so many more movement options than most games of the time that it felt truly revolutionary. Or, well, Mega Man X felt revolutionary, and then X2 just made it even better. 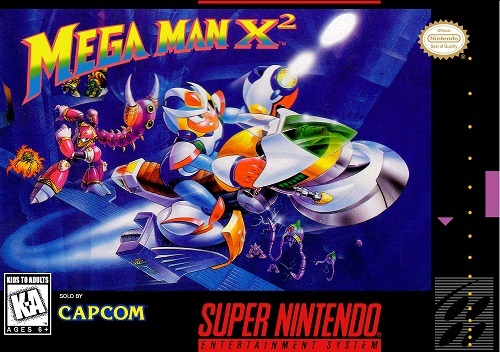 When Mega Man X3 first came out, I thought it was the coolest thing that I had ever seen. Of course, for many months I was only able to enjoy it through coverage in Nintendo Power, but the first time I was able to actually rent and play the game was downright magical. I’ve since cooled on Mega Man X3. Lots of other folks seem to take issue with it as well, and I’m pretty sure that they all have smarter reasons than I do. It’s a fine game at it’s core, but there are a fair number of things about it that annoy me. The absolute worst thing is how they made Zero playable. The concept of being able to play as Zero was mind-blowing for me, but Capcom really blew the implementation. For one, you only get to sub in Zero for X; you can’t actually choose to play the game as Zero. Secondly, he’s only good for so long. As soon as you come to a mini-boss or boss door, he taps out and you can’t summon him again for the duration of the stage. The worst part of all? If you die while playing as Zero, he’s gone forever. Complete the stage, get a game over, find seventeen extra lives – nothing will bring him back short of restarting the game. Huge bummer. Another cool/annoying little feature are the enhancement chips. In every game, X can find and equip a set of special armor parts that enhance his abilities. In X3, it goes one step further by providing enhancement chips for each part, which give even better benefits. Sadly, you’re limited to only one of the four chips, so… choose wisely. Will you take the one that allows two air-dashes or the one that refills your energy while standing still? Of course, there’s a super-secret gold armor that gives you all four chips at once, but if you get it (it’s very hard to find), you’re already two stages from the end, so… Good for making that final push, but you never get a chance to really play with it. 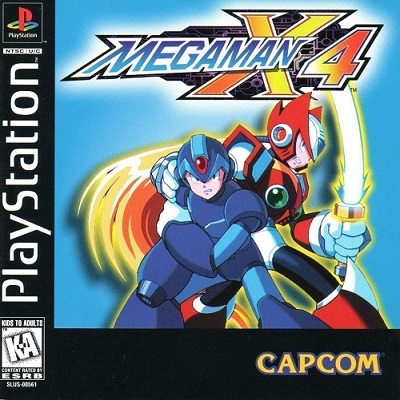 In my experience, many people put Mega Man X4 up on a similar level as X1 and X2. It’s the first Playstation game in the series, and there are a lot of big visual improvements that go along with the platform jump. Of course, the basic gameplay remains mostly the same, if a little bit slower. At the time of the game’s release, however, reviewers were particularly mean to X4 because “it’s only a sidescroller” in a world that was moving to fancier games with 3D graphics. Because of course you want ugly polygon blobs over clean, detailed sprites. Really, what people should have been more critical of were the anime cutscenes that were loaded with awful, awful voice acting. Remember, this is Capcom in the Playstation era. It’s every bit as bad as the original Resident Evil’s voice acting, but X4 never got the ironic love that RE enjoys because it only had one meme-worthy line. Additionally, like I said before, there wasn’t really a lot that differentiated this game from the last besides flashier backgrounds and more detailed sprites. It’s still a matter of jumping, shooting, and collecting the various armor parts and whatnot. However! There was one major change that really made folks perk up: you can play the entirety of the game as Zero this time around. Zero plays completely differently from X, since he uses his Z-saber as his main weapon. He still has a buster, but it’s a piddly little thing that never gets upgraded. Zero also gains new sword techniques from bosses rather then new weapons, and he has his own unique story path, which is almost enough to make it feel like you get a whole second game. The stages are all the same, and the bosses don’t change at all, but the melee focus changes how you approach nearly everything, which is huge. While I’d rather play any of the SNES games, X4 is far and away my favourite of the post-SNES games. So… it’s all downhill from here, my friends. X5 is basically the same game as X4. Just like X2 was to X1. And really, if you want to break it down even farther, X5 is the same game as X1, but with all sorts of extra bits and pieces superglued to it. More bits and pieces than ever, even! But first, let’s talk about the story. 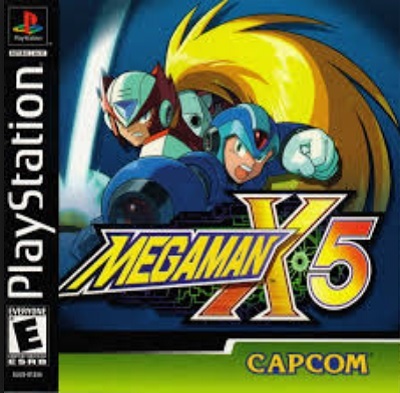 Because X5 is where it really takes a huge turn, and also because X5 was written to be the last entry in the X series. From the beginning, we’ve been fighting against Sigma, who is a robot gone haywire that wants to infect all other robots and make them rise up against humanity. Basically he is Magneto, but crazier. The virus that drives Sigma was originally transferred over from Zero, who seems to have either been cleansed of it or is able to suppress it. There’s a lot of lore in between, and it all even links back to the original Mega Man series, so I’ll skip to the current situation. Sigma is now trying to drop an orbital space colony on Earth that will wipe out all human life, all while trying to turn Zero back to the dark side. There are many diverging paths to the story, but they all end up with Zero dead. Now, the story causes two of the main problems I have with the game: the first is that you’re on a time limit. You essentially have 16 stages (win or lose) to stop the space colony crashing into the Earth. Fail that and you lose the ability to play as Zero and are locked into the bad ending. Secondly, whether you stop the colony or not is completely random. No matter how fast you complete the stages, the outcome is left up to the RNG. It’s garbage. Also garbage is that bosses now drop upgrade parts that you can use to power up your guys, but it’s impossible to know what they’ll drop, and they drop different things based on their level. Oh, also bosses level up as you complete stages. I still don’t know what that really means, but it’s a thing. I think what I’m trying to get across here is that Mega Man X5 is a giant mess of pointless and obscure systems. There’s a decent game underneath it all, but it’s hard to appreciate because of all the cruft. If you got confused by the previous two paragraphs and thought that Mega Man X5 was a giant mess (you’d be right), you’re going to find that Mega Man X6 is completely impenetrable. Issue #1: Zero is dead. You can no longer play as Zero. That is, unless you go through some arcane ritual to revive him. I don’t know what that is, and I don’t particularly care. There are like seventeen different types of Zero ghosts in this game, referred to as different kinds of nightmares or viruses or whatever, and I just can’t summon the will to give a damn in my old age. Issue #2: I don’t remember exactly how it works, but there’s some sort of system where stages become infected by the nightmare or something, and then they become harder in some way. Obviously the details have been lost to me, but I think it’s typically the addition of some sort of environmental hazard. Any which way you slice it, you may get screwed when the RNG turns the next stage you want to beat into a super-difficult death zone. Issue #3: The game is already ridiculously hard. Even without the stage modifiers, X6 is easily the hardest of the series. So hard, in fact, that I never beat it. Partly because of the difficulty, and partly because even as a dyed-in-the-wool Mega Man fanboy, I realized that the game was trash and wasn’t worth any more of my time and/or effort. Issue #4: To curb the difficulty, Mega Man X6 has a ton of little power-up items that you can equip. Most of these, if not all, are given to you by finding stranded reploids in the various stages. No problem. That’s a fun little treasure hunt! Except for the fact that if the little octopus ghost monsters that spawn out of nowhere reach one of your friends first… they die and you lose that power up. Forever. No retrying the stage. You have to load your last save and hopefully do better. Good luck with that nonsense! I would love to come up with something nice to say about X6, but I just can’t. Maybe I’ll be able to come up with something the next time I try to play it. To be 100% with you, I can’t honestly speak to the quality of Mega Man X7. I’ve never really played it. I didn’t have a Playstation 2 at the time, though my brother did, and he bought it. I watched a few stages, said “this looks like absolute garbage” and that was the end of my relationship with Mega Man X7. What I do know, however, is that X7 has a terrible reputation. Supposed to be the worst in the series. 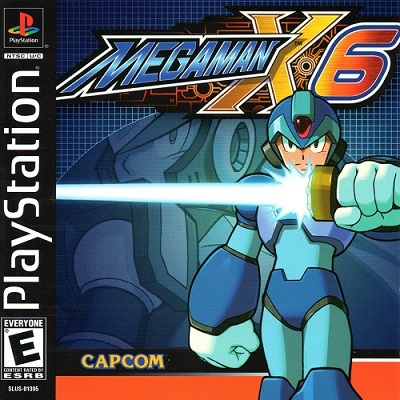 It seems impossible after the garbage fire that was X6, but Capcom saw fit to bring the X series into the future and make it 3D. Or, at least, they made portions of it 3D? I’m not totally clear, but it didn’t work. People hate this game with the firey passion of… I don’t know, like a bonfire? I think for the most part it’s just so disappointing that folks can’t even get truly riled up about how bad it is. 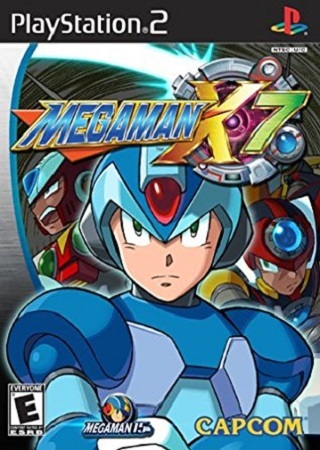 Nobody ever talks about Mega Man X7 because it’s not worth talking about. The one other thing that I know about this game is that at the beginning, you aren’t allowed to play as X. A Mega Man game, where you can’t be Mega Man. What a joke! I’m sure he’s unlocked at some point, but I don’t know if it’s a thing you have to work for, or if it just happens over the course of normal play. In X’s absence, you obviously get to be Zero, but if you really need to shoot, there’s also brand new hero Axl, who has the ability to transform into enemies. I don’t think people were crazy about Axl? I think he’s alright. 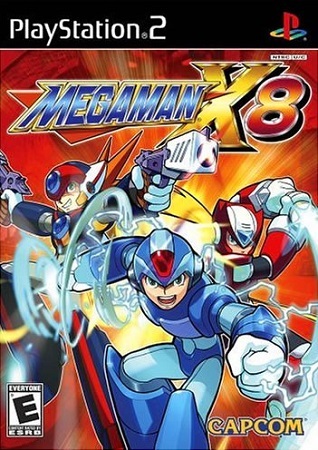 Capcom doubled down on him though, as he was featured as the third playable hero in every X game afterward, and Mega Man ZX Advent on DS does not feature the character proper, but is more or less built around his transforming power (for better or for worse). Here we are, finally at the last numbered entry of the Mega Man X series. It’s actually kind of a miracle that it even exists, considering that the general populace was mostly over Mega Man X even before the previous two dumpster fires happened. But it does, and personally, I’m thankful. Mega Man X8, generally speaking, brings the series back to a playable state. It’s not great, and in fact it has at least one level that is objectively terrible, but compared to the last two games, X8 is golden. Most importantly, the game goes back to its side-scrolling roots. The graphics are all still in 3D, but you’re typically moving on a 2D plane. X is playable from the beginning again, and along with Zero and Axl, you can also unlock the three lady navigator characters as playable characters. They all play very simliarly to their male counterparts, but it’s still nice to actually have playable female characters in a Mega Man game. Probably the most shocking thing of all, though, is that Sigma is actually not the main antagonist! When it comes to weaknesses, X8 does suffer a few. For one, a handful of the stage gimmicks are blah. I seem to recall that Dark Mantis’ stage has some stealth-lite nonsense going on. The winner by a country mile is Gigabolt Man-o-war. His stage is a weird 3D jetbike chase through futuristic city, which is not only aggravatinly difficult, but intensely annoying, as Gigabolt will be repeating the same three trash talk lines over and over until you win. It’s a very bleak spot on the game, but at least it’s pretty short if you manage to be good at it. X8 also incorporates a much-too-complicated upgrade system that I’m fairly sure I never understood. I appreciate the thought, but the fact that the upgrade process is still abstruse make sit less appealing. What I like the very most about Mega Man X8, though, is just one tiny little easter egg: under certain circumstances, you can unlock a boss fight against a little pixelated Cut Man, one of the robot masters from the very first Mega Man game. It doesn’t do anything for you, and it would be very unlikely that you’d find him without being told how, but I really dig the nod back to the series’ roots. And so, there you have it. Once again, I have typed way too many word about Mega Man. Please understand, and be ready for me do do so again probably much sooner than you expect. There’s literally only one thing in the world that I know a lot about, and that thing is Mega Man. Now ff you’ll excuse me, I have to go run X2 again because writing this has reminded me that I haven’t played it in roughly forever.